The dolphins want you to know that it’s important to forgive yourself. We all carry judgments and guilt, about ourselves and others. If we want to lighten up and feel more joy, more happiness, it’s really essential to let go of the old emotions, our “drag in the water” by forgiving ourselves for hanging onto it in the first place. Do you do what I do —hang on to past experiences and go over and over what I could have said or done differently? It’s hard to move past them while constantly analyzing and rehashing. It takes a lot of energy to do this too, energy I could spend thinking about what makes me happy, or visualizing to manifest my dreams. The dolphins want you to know that in their eyes, we are perfect human beings. They love to observe us, because we make things so much more complicated than they do. It makes us interesting to them. And they know where we came from, because they never forgot, like we did. They know we came from the Creator, that our souls are beautiful reflections of Creator, that we are those beautiful souls here in a body we have just borrowed for a while, in order to have this earthly experience. And in other lifetimes we could have been masters, healers, teachers, or even dolphins! They say “if we only knew who we’ve been, we would not be so hard on ourselves now”. Does that help you to know that it’s okay to forgive yourself, to ease up, give yourself a break? Something else to think about, say the dolphins, is that maybe you are here not to learn a bunch of lessons, but just to be a mirror reflection for others, so they can learn their lessons. Maybe you already “got it”. And you are just shining a light on a lesson for someone else, which means you have mastered this one. You are just going through it again to help someone you love. How amazing is that? And how amazing are you? You, reading this, the one with the big heart, huge light, and fluffy wings. Now will it be easier? Forgive yourself now, and get used to feeling those fluffy wings. There is a place, not far from here, where you can find peace, the kind of peace you’ve only felt in certain places before — churches, cemeteries, under a starry sky on a quiet night. Would you like to go there now? It’s just a short trip. It won’t take long. Sit quietly and close your eyes. Breathe deeply for a few moments. Imagine you are in one of those peaceful places. Remember how it feels, the solitude, the space to think, the quiet rhythm of your heartbeat, the flow of your breath, the air on your skin. Now think about what and who you love. Family, friends, pets, your work, your home, the sunshine, blue clouds, the moon, the surf, the snow and more. Stay there, in those thoughts and keep breathing slowly. Now imagine that this space you are in is an actual room or chamber, and it’s in your heart, in the middle of your chest. Look around this room, this chamber. Do you notice what it looks like? Does it have a color, are there walls, is there a floor? What do these walls look like? Is there a place to sit? If you like, you can rest there for awhile, seated in your peaceful spot, thinking about your loved ones. While you are here, you can even ask a question. The answers you receive here come from a very deep and sacred part of you- your spirit. You can trust them, trust that they are real and true answers. If you like, you can come back to visit any time, and get to know your spirit, just resting in the richness of this deep peace. Now that you know the journey is short, you can always drop in for a quick visit. Or you can stay here, choosing to live from your heart, from your spirit. It’s a loving place, with comfortable feelings, and a higher vibration. After awhile you might begin to miss it if you don’t visit often. We hope you decide to stay. You can feel us here, in your heart, enfolding you in our wings, standing behind you, propping you up when you are weary, admiring your courage, wiping your tears away. We are always with you, but you can feel us more easily from a place of peace in your heart. Wouldn’t you like to be here with us, where it feels like home, all of the time? 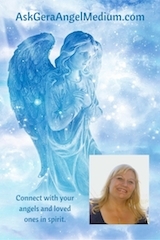 Join us now and feel our wings brush your face, caressing you with waves of love and light, wrapping you in peace and comfort. We are your angels and we call to you from your heart. Listen closely now. How do you find peace? Share your comments below.